"It is a pity that there is no evidence left behind to show the exact situation in Uva in terms of population or agriculture development after the rebellion. The new rulers are unable to come to any conclusion on the exact situation of Uva before the rebellion as there is no trace of evidence left behind to come to such conclusions. If thousands died in the battle they were all fearless and clever fighters. If one considers the remaining population of 4/5 after the battle to be children, women and the aged the havoc caused is unlimited. In short the people have lost their lives and all other valuable belongings. It is doubtful whether Uva has at least now recovered from the catastrophe". (Journal of Uva) The above is a minute made by Herbert White who was a British Government Agent in Badulla after the rebellion. The 1817 rebellion described as the Uva rebellion by historians is the culmination of the peoples anger and dissatisfaction over the British rule which promised to uphold and foster the Buddhist religion and observe the traditions and norms that hitherto prevailed in the Kandyan Kingdom up to the signing of the convention of 2nd March 1815. Mr. Wiliam Tolfry, the Chief Translator of the British Government; appraised the Commissioner in-charge of Kandyan affairs Mr. Sutherland of the volatile situation that prevailed in the country at the beginning of December 1816 and January 1817, and warned him of an impending revolt against the British administration. Reports reached the authorities that one Duraisamy,a relative of the deposed king and claiming his rights to the throne is mustering the support of the people in Uva for a rebellion and that some Sinhalese leaders too joined him. Duraisamy was the son of Kalu Nayakkar, a relation of the former king. He was a native of Sath Korale, a Buddhist priest for sometime and now appeared in public as Wilbawe. These facts were later confirmed by the evidence of Udugama Unnanse at the trial. The appointment of a Malay Muhandiram Hadji by Major Wilson - Resident in Badulla was another action of the British which earned the displeasure of the Sinhalese to the British administration. The areas of Uva Wellassa, Nuwarakalaviya were neglected jungle areas which had a predominant population of Muslims who disrupted time and again the smooth supply of salt and dry fish to the people in the Kandyan Kingdom. In 1817 October the rebellion broke out. Major Wilson who was in Badulla sent out a battalion under Hadji Muhandiram, commanded by Hadjis brother himself to quell the rebellion. The people of Uva were so provoked with this incident that they caught Hadji and produced him before Duraisamy who after trial sentenced him to be beheaded. The British were not deterred by this action of the Sinhalese. Their arrogance and pride saw no limit when once again on 12.10.1817 Major Wilson himself marched to Uva with a Malay troop under his command with Lt. Newman. On this march Major Wilson was killed near the present Bibile town when an arrow aimed by the Sinhalese rebels pierced his chest. The British and Malay soldiers had to surmount difficult terrain which they were not used to in this type of gaurilla battles. This was a novel experience which retarded their forward march. In the meantime Lt. Col. Hardy gathered intelligence that the rebels were on the march to Dolosbage in Gampola area. Hence on 18.10.1817 he proceeded towards that area with troops commanded by Major OBrien. On arrival they found that the area was calm and quiet free of any incidents. The people of Hatarakorale and Tunkorale too refused to join the rebels. The British government attributed this attitude of the natives to the influence that Molligoda exerted in the area and the personal grudge he had with Keppetipola. But in Galaboda Korale which was the native place of Keppetipolas father the Britishers faced problems with the rebels. It was observed that Keppetipola had not been seen in the area for nearly eight months after the rebellion broke out. To show the gratitude of the British to those who did not participate in the rebellion, the British government by gazette notification No. 19 of 1818 reduced the grain tax from 1/10 to 1/14. By section 22 of the same order all lands belonging to those in the Korale were exempted from land tax. In terms of Clause 53 a centralized civil and judicial system of administration was set up with Headquarters in Kandy from where three British civil servants started functioning. The rebellion spread to the other areas of the Kandyan Kingdom. In the month of April 1818 Rev. Wariyapola Sri Sumangala of Asgiri Maha Viharaya removed the sacred tooth relic to Hanguranketa an area of difficult terrain. Subsequent to the removal of Tooth Relic from Kandy the rebellin broke out in Matale, Dumbara, Denuwara, Walapane, Hewaheta etc. by the people joining the rebels. To face the new developments in the war front troops had to be brought from Batticaloa and Kandy. Most of the soldiers in the British troops were killed by the Sinhalese. By now a gazette notification No. 6 of 1817 was issued awarding a reward of two thousand Rix dollars to the head of each rebel - Wilbawe, Kiulegedara Mohottala, Butawe Rate Rala and other rebel leaders. Kiulegedara Mohottala was arrested and beheaded at Bogambara on 18.12.1818. Kiulegedara Mohottala was the Disawa of Walapana and a royal poet in the Court of Sri Wickrama Rajasinghe. 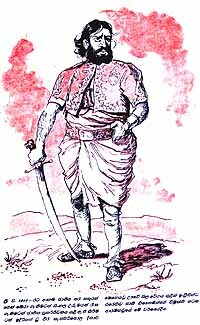 The Disawa of Viyaluwa Ellepola, Ehelepola, a brother of Maha Adikaram was also arrested and beheaded at Bogambara on 27.10.1818. By now the following leaders also surrendered. They were Mattamagoda Disawa of Tunkorale, Kobbekaduwa Disawa of Udapalatha, Dambawinna Disawa, Dimbulana Disawa, Godagedara Disawa, Kataragarna Maha Bethme and Basnayaka Nilame, Bootawe Rate Rala. Towards the end of September with the onset of monsoon rains Madugalle Basnayaka Nilame and Ellepola Adikaram too surrendered. The situation prevailing in Uva and Wellassa was so precarious that the English set fire to villages, houses, livestock and whatever they could burn. By now Pilamatalawe gave leadership to rebels having put forward another pretender to the throne as King Weerabahu - a Nayakkar. At this time the Disawa of Wellassa, Millawa who was an ailing elderly leader was removed by the British and Keppetipola was appointed as Disawa of Wellassa. The British sent Keppetipola who remained in Kandy until 17.10.1818 to Uva to bring the situation under control. At about the same time a British Officer Col. Bartok took into custody Weerabahu the Pretender. When Keppetipola arrived in Wellassa Sinhalese were engaged in a fierce battle with the British soldiers Keppetipola sent back all his arms and ammunitions to the British Agent and joined the Sinhalese rebels to lead the battle. With this change of events the other Sinhalese leaders such as Pilamatalawe Disawa of Sathkorale, Madugalla, Uda Gabada Nilame, Ellepola who was leading Viyaluwa, Ehelepola a brother of Maha Adikaram Ihagama, Godagedara Adikaram, Badalkumbure Rala etc also joined the rebels. The British had to bring troops from India to quell the rebellion. Finally the British were able to arrest most of the leaders. Properties of 18 rebel leaders were confiscated Pilimatalawe who was ailing at the time of arrest was exiled to Mauritius Islands. Keppetipola and Madugalla were beheaded in Bogambara after trial on 18.11.1818 thus ending another chapter of our history. History records that King Senerath of Kandy fought against a battalion of 21,000 Portuguese soldiers in 1630 in the famous Randeniwela battle. The Portuguese soldiers were led by General Constantine De Za. Mudliyar Don Cosmas Wijesekara who was with the Portuguese joined the kings forces after victory. The king was so pleased to accept him and conferred on him the honorary title of "Wickramasinghe" and gifted to him the Katugaha village and the Walawwe close to Bibile. The elder daughter of this Mudliyar married Wijayasundara Brahmana Mudali. The son born to them was named Ehelepola who was the Disawa of Uva. The Disawas son was also the Disawa of Uva who died in 1807. This Ehelepola had two sons one of whom was the Maha Adikaram of Sri Wickrama Rajasingha (1798 - 1815) King of Kandy. This Adikarams sisters son was Keppetipola. He was born in Monerawila village in Matale and hence known as Monerawila Keppetipola. This was how Keppetipola had connections to Uva. His grand parents and uncles held office in Uva Wellassa. Golahela Disawa (Rajapaksa Wickramasekara) who was Diyawadana Nilame and Dissawa of Tamankaduwa during the reign of Sri Wikrama Rajasinghe was the father of Keppetipola. With this high connections through out the Kandyan Kingdom and the inherent warrior qualities the Britishers thought that he will be the most suitable person to quell the rebellion and help them to establish their writ of government.